This technique consists of utilizing negative reps with 3 of the best chest exercises.. 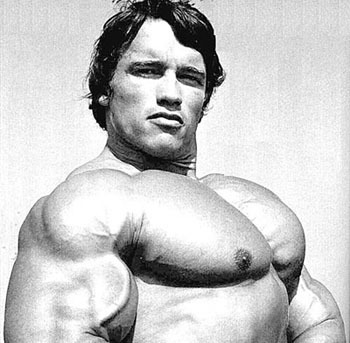 If you've read Arnold's "Encyclopedia of Bodybuilding", you know that he is an advocate of sometimes using a heavier weight than you can handle with strict form in order induce muscle confusion and force your muscles to adapt to the higher weight. Muscle confusion is arguably the fastest way to build muscle. This is more of a build muscle mass workout and not so much a get ripped workout. Your workout journal!... get a notebook to write down exactly how many reps and sets and with what weight you use. Next, you're going to do 2 sets of each exercise. Remember, the best chest exercise is the one that makes your chest muscles grow. Ideally you'll do this twice a week in place of whatever else you were doing for pec workout... this will help you build chest muscles fast. So...2 sets of each exercise. Use a weight that's heavy enough that you can barely do 5 or 6 reps. This is really important. You want to be in control enough of the weight that you can use pretty strict form for those first 5 or 6 reps. When I say negatives I mean that you'll do whatever you have to hoist the weight up, but then you will do the negative movement as slowly as possible. You're going to need a spotter, but even if you workout alone you'll be able to find someone in the gym that will give you a quick spot. So for the bench press, you'll get the weight up and then lower it as slowly as possible... do at least 3 negatives on each set. For the incline dumbbell press its the same thing... shove the weight up and then let it down slowly. On the cable crossover just shove the handles to the middle and then let them back out as slowly as you can. Do this routine for your upper chest workout for 8 weeks. Its always good to completely change things up every 8-12 weeks. Also, make sure you're eating a ton of muscle building foods.